They all started on the same project: a garter stitch hat with bulky weight yarn. A simple rectangle that will be pulled on one end at bind-off and topped with a big pom-pom. 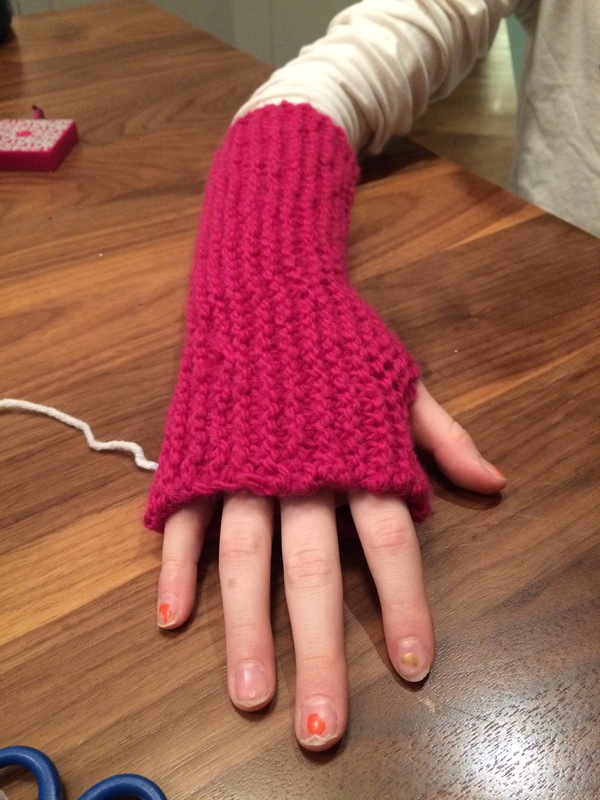 Last week, Brigid decided that she’d rather turn her hat-to-be into fingerless gloves. Why not? After measuring her wrist, we realized the time – and length- were right. So I showed her how to bind off and then how to seam. We marked the thumb hole, and she seamed up to that point. Then the top little bit and voila! She was thrilled — and rightly so. The other two girls were appropriately happy for her and encouraged her to cast on the next on quickly “otherwise you might stop at one.” So wise! After being on hiatus for about a month, my weekly knitting class has started up again, and the New Year seems to have infused everyone with energy. All in a 8″ x8″ square (larger or smaller to suit one’s taste). The finished product, ready to wash dishes or bodies, wipe up spills, and repeat as needed. After finishing a pair of socks for her brother and three chunky GAP-tastic Cowls for her daughters, Judy couldn’t stop herself — and created her first design in the process (although she doesn’t think she did). A friend of her youngest (16) requested a red cowl, but Judy doubted that the teen would wear an all-red cowl and, truth be told, didn’t want to buy yarn to make it. Instead, she decided to use the cream bulky wool that she had and added a strand of red sport weight from her stash. I think the result is fabulous and am quite sure the selfie-snapping recipient agrees. Several of the students in my knitting class want to learn how to read a pattern, so I’ve started them off on a delightful cotton washcloth. Washcloths are great first project because (1) there’s a high probability you will finish (unlike a scarf which can be interminable), and (2) they provide ample opportunity for learning new stitches and reading a pattern. This was the ideal opportunity to reinforce a key rule of following a pattern: read the entire pattern before you begin. And take notes, right on the pattern. Rachel did a lovely job of this. See those four checks next to each of the seed stitch border row instructions? sl5P wyif = slip the next 5 sts as if to purl with yarn at front of work (this forms a yarn strand on the right side of the fabric). This is the point at which a knitter must speak aloud, slowly and clearly while following the instructions word for word. It usually takes me two or three talk-throughs before I understand what I’m to do. I find it best to do this while alone or at least at home, where I’m less likely to be interrupted by someone asking “what did you say?” Because then I’d have to stop and explain and then start all over again! Rachel figured it out — while hanging out at her daughter’s soccer game, no less. She even sent a photo when she got home. Look at those bands stretching across 5 stitches! I’m so pleased to be teaching again! For the past two Wednesday mornings, a group of 8 intrepid women has gathered around the table and dived into knitting. The two hours fly by — at least, for me. Most of the students have knit before — some many years ago, some intermittently, some just starting. Nearly all want to learn how to fix mistakes since that’s why many of them stop a project. They realize they’ve done something wrong but don’t know how to remedy and move on. Reading a pattern is also high on the list of goals. Seema had never held a pair of needles, so her task for the first two weeks was to become familiar with the feel of the needles and yarn: holding them without gripping, working yarn in the fingers of her right hand, shoulders relaxed. Explaining and demonstrating for her made me realize how much of this is second nature to someone who has the “muscle memory” of the craft. By the second class, Seema cast on an entire 30 stitches and was moving on to her second row of what would most likely become a cotton washcloth. Amy arrived at the second class with a nearly-finished hat, but she needed to switch to double-pointed needles (DPNs) for the top of the crown. DPNs can be daunting since there are several (4 or 5) and full of points (8 or 10!). But once you realize that you still only knit with two needles at a time while the other needle(s) are holding places for extra stitches, you can focus on those two needles and not get too freaked out about what’s hanging out on the other needles. Amy had no trouble making the switch and decreasing to her final five stitches. A few minutes later, after cutting the working yarn and running it through those final stitches, tightening, and weaving in the ends. Lo and behold, a lovely multi-colored, rolled brim hat! Many of the beginning knitters I’ve taught think their first project should be a scarf, more often than not, a basic garter stitch scarf. I generally counsel them against this, pointing out that scarves are really, really long and can get veeeeery boring very fast. I’ve written about moving beyond scarves before. I might suggest a neck warmer — which is really a short, wide scarf turned on its side and buttoned — or a hat, which allows you to learn decreases or even cables. 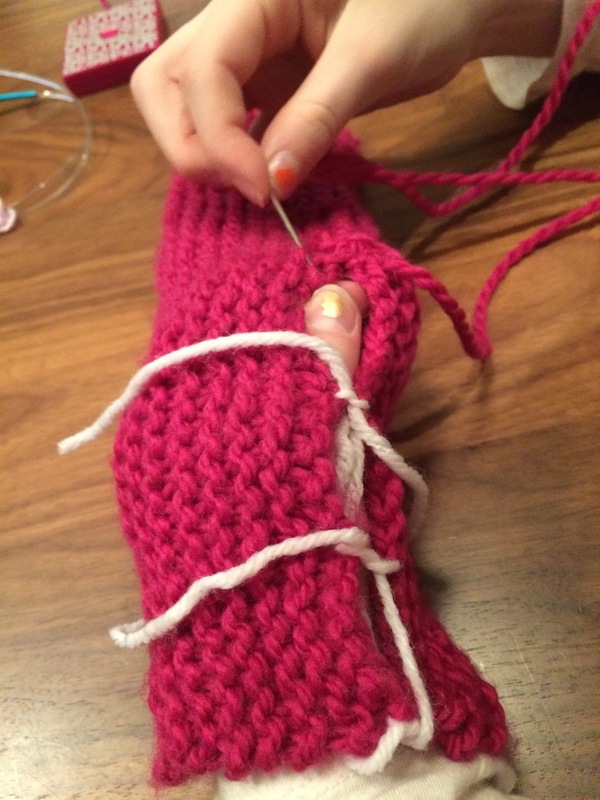 My favorite first knitting project by a student was a golf club “cozy.” How cute is that?! But now I’ve discovered my go-to recommendation for a first project: the Encompass Scarf by the wonderful Yarn Harlot herself (scroll down post). – knitting in the round is a great skill (again, cleverness factor) that you’ll use in many other projects — hats, sweaters, socks — even golf club cozies! Next time I make Encompass, think I’ll put together different patterns. Let the learning continue!